I don't think that we need any new values. The most important thing is to try to revive the universally known values from which we have retreated. 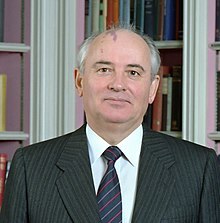 Mikhail Gorbachev (Russian: Михаи́л Серге́евич Горбачёв, IPA: [gərbəˈtɕof], commonly anglicized as Gorbachev; born 2 March 1931) was leader of the Soviet Union from 1985 until 1991. His attempts at reform helped to end the Cold War, but also ended the political supremacy of the Communist Party of the Soviet Union (CPSU) and dissolved the Soviet Union. He was awarded the Nobel Peace Prize in 1990. If the Russian word "perestroika" has easily entered the international lexicon, this is due to more than just interest in what is going on in the Soviet Union. Now the whole world needs restructuring, i.e. progressive development, a fundamental change. We are witnessing most profound social change. In the name of Communism we abandoned basic human values. So when I came to power in Russia I started to restore those values; values of "openness" and freedom. All of us are linked to the cosmos. Look at the sun. If there is no sun, then we cannot exist. So nature is my god. To me, nature is sacred. Trees are my temples and forests are my cathedrals. Our rockets can find Halley's comet, and fly to Venus with amazing accuracy, but side by side with these scientific and technical triumphs is an obvious lack of efficiency in using scientific achievements for economic needs, and many Soviet household appliances are of poor quality. Variant: Soviet rockets can find Halley's comet and fly to Venus with amazing accuracy, but . . . many household appliances are of poor quality. We are witnessing most profound social change. Whether in the East or the South, the West or the North, hundreds of millions of people, new nations and states, new public movements and ideologies have moved to the forefront of history. Broad-based and frequently turbulent popular movements have given expression, in a multidimensional and contradictory way, to a longing for independence, democracy and social justice. The idea of democratizing the entire world order has become a powerful socio-political force. At the same time, the scientific and technological revolution has turned many economic, food, energy, environmental, information and population problems, which only recently we treated as national or regional ones, into global problems. Thanks to the advances in mass media and means of transportation, the world seems to have become more visible and tangible. International communication has become easier than ever before. Variant: The market came with the dawn of civilization and it is not an invention of capitalism. … If it leads to improving the well-being of the people there is no contradiction with socialism. I believe, as Lenin said, that this revolutionary chaos may yet crystallize into new forms of life. For a new type of progress throughout the world to become a reality, everyone must change. Tolerance is the alpha and omega of a new world order. My life’s work has been accomplished. I did all that I could. We have retreated from the perennial values. I don't think that we need any new values. The most important thing is to try to revive the universally known values from which we have retreated. As a young man, I really took to heart the Communist ideals. A young soul certainly cannot reject things like justice and equality. These were the goals proclaimed by the Communists. But in reality that terrible Communist experiment brought about repression of human dignity. Violence was used in order to impose that model on society. In the name of Communism we abandoned basic human values. So when I came to power in Russia I started to restore those values; values of "openness" and freedom. I began to feel the desire for something more; I wanted to do something to make things better. With Yeltsin, the Soviet Union broke apart, the country was totally mismanaged, the constitution was not respected by the regions of Russia. The army, education and health systems collapsed. People in the West quietly applauded, dancing with and around Yeltsin. I conclude therefore that we should not pay too much attention to what the West is saying. Americans have a severe disease — worse than AIDS. It's called the winner's complex. I express the very deepest condolences to the family of the deceased on whose shoulders rest major events for the good of the country and serious mistakes. We had 10 years after the Cold War to build a new world order and yet we squandered them. The United States cannot tolerate anyone acting independently. Every US president has to have a war. We desperately need to recognise that we are the guests, not the masters, of nature and adopt a new paradigm for development, based on the costs and benefits to all people, and bound by the limits of nature herself rather than the limits of technology and consumerism. Never before has the idea that peace is indivisible been so true as it is now. In our times, good relations benefit all. Any worsening of relations anywhere is a common loss. Progress towards the civilization of the 21st century will certainly not be simple or easy. I am an optimist and I believe that together we shall be able now to make the right historical choice so as not to miss the great chance at the turn of centuries and millenia and make the current extremely difficult transition to a peaceful world order. Has not the political thinking in the world changed substantially? Does not most of the world community already regard weapons of mass destruction as unacceptable for achieving political objectives? Preparing for my address I found in an old Russian encyclopedia a definition of "peace" as a "commune" — the traditional cell of Russian peasant life. I saw in that definition the people's profound understanding of peace as harmony, concord, mutual help, and cooperation. This understanding is embodied in the canons of world religions and in the works of philosophers from antiquity to our time. And, ideally, peace means the absence of violence. It is an ethical value. I began my book about perestroika and the new thinking with the following words: "We want to be understood". After a while I felt that it was already happening. But now I would like once again to repeat those words here, from this world rostrum. Because to understand us really — to understand so as to believe us — proved to be not at all easy, owing to the immensity of the changes under way in our country. Their magnitude and character are such as to require in-depth analysis. Applying conventional wisdom to perestroika is unproductive. It is also futile and dangerous to set conditions, to say: We'll understand and believe you, as soon as you, the Soviet Union, come completely to resemble "us", the West. No one is in a position to describe in detail what perestroika will finally produce. But it would certainly be a self-delusion to expect that perestroika will produce "a copy" of anything. A period of transition to a new quality in all spheres of society's life is accompanied by painful phenomena. When we were initiating perestroika we failed to properly assess and foresee everything. Our society turned out to be hard to move off the ground, not ready for major changes which affect people's vital interests and make them leave behind everything to which they had become accustomed over many years. In the beginning we imprudently generated great expectations, without taking into account the fact that it takes time for people to realize that all have to live and work differently, to stop expecting that new life would be given from above. During the last six years we have discarded and destroyed much that stood in the way of a renewal and transformation of our society. But when society was given freedom it could not recognize itself, for it had lived too long, as it were, "beyond the looking glass". Contradictions and vices rose to the surface, and even blood has been shed, although we have been able to avoid a bloodbath. The logic of reform has clashed with the logic of rejection, and with the logic of impatience which breeds intolerance. I have long ago made a final and irrevocable decision. Nothing and no one, no pressure, cither from the right or from the left, will make me abandon the positions of perestroika and new thinking. I do not intend to change my views or convictions. My choice is a final one. Our democracy is being born in pain. A political culture is emerging — one that presupposes debate and pluralism, but also legal order and, if democracy is to work, strong government authority based on one law for all. This process is gaining strength. Being resolute today means to act within the framework of political and social pluralism and the rule of law to provide conditions for continued reform and prevent a breakdown of the state and economic collapse, prevent the elements of chaos from becoming catastrophic. All this requires taking certain tactical steps, to search for various ways of addressing both short- and long-term tasks. Such efforts and political and economic steps, agreements based on reasonable compromise, are there for everyone to see. After a time of rampant separatism and euphoria, when almost every village proclaimed sovereignty, a centripetal force is beginning to gather momentum, based on a more sensible view of existing realities and the risks involved. And this is what counts most now. There is a growing will to achieve consensus, and a growing understanding that we have a State, a country, a common life. This is what must be preserved first of all. The more I reflect on the current world developments, the more I become convinced that the world needs perestroika no less than the Soviet Union needs it. All members of the world community should resolutely discard old stereotypes and motivations nurtured by the Cold War, and give up the habit of seeking each other's weak spots and exploiting them in their own interests. We have to respect the peculiarities and differences which will always exist, even when human rights and freedoms are observed throughout the world. I keep repeating that with the end of confrontation differences can be made a source of healthy competition, an important factor for progress. This is an incentive to study each other, to engage in exchanges, a prerequisite for the growth of mutual trust. For knowledge and trust are the foundations of a new world order. I am an optimist and I believe that together we shall be able now to make the right historical choice so as not to miss the great chance at the turn of centuries and millenia and make the current extremely difficult transition to a peaceful world order. A balance of interests rather than a balance of power, a search for compromise and concord rather than a search for advantages at other people's expense, and respect for equality rather than claims to leadership — such are the elements which can provide the groundwork for world progress and which should be readily acceptable for reasonable people informed by the experience of the twentieth century. Have we not been able to cross the threshold of mistrust, though mistrust has not completely disappeared? Has not the political thinking in the world changed substantially? Does not most of the world community already regard weapons of mass destruction as unacceptable for achieving political objectives? I view the award of the Nobel Prize to me as an expression of understanding of my intentions, my aspirations, the objectives of the profound transformation we have begun in our country, and the ideas of new thinking. I see it as your acknowledgment of my commitment to peaceful means of implementing the objectives of perestroika. Purportedly from an interview in Ankara, Turkey where he was a guest at a seminar at the American University. (February 2000) However, the actual source is unverifiable and appears to have occurred with different interviewers. We came to the conclusion that we could no longer continue to live the way we were. We needed major changes in every department of life. And now, the Soviets themselves may, in a limited way, be coming to understand the importance of freedom. We hear much from Moscow about a new policy of reform and openness. Some political prisoners have been released. Certain foreign news broadcasts are no longer being jammed. Some economic enterprises have been permitted to operate with greater freedom from state control. Are these the beginnings of profound changes in the Soviet state? Or are they token gestures, intended to raise false hopes in the West, or to strengthen the Soviet system without actually changing it? We welcome change and openness; for we believe that freedom and security go together, that the advance of human liberty can only strengthen the cause of world peace. There is one sign the Soviets can make that would be unmistakable, that would advance dramatically the cause of freedom and peace. General Secretary Gorbachev, if you seek peace, if you seek prosperity for the Soviet Union and Eastern Europe, if you seek liberalization: Come here to this gate! Mr. Gorbachev, open this gate! Mr. Gorbachev, tear down this wall! Although Mikhail Gorbachev is a man of quite outstanding talent and ability, he insisted recently that the story of his own family is actually history itself or in other words the history of the Soviet Union. Gorbachev is in fact a child of the revolution and the world war, of Lenin's, Stalin's, Khrushchev's and Breshnev's Soviet Union. And like most people in this world he is a product of the society in which he grew up. Today, this Soviet society is a historical experiment which is being shaken to its foundations, and this is so not least because Mikhail Gorbachev was also capable of breaking the mould of the society from which he sprang. Or as he personally expressed it in the televised interview, in which he spoke of the perestroika which he symbolises: "We came to the conclusion that we could no longer continue to live the way we were. We needed major changes in every department of life." Increased openness, was perhaps the most profound change inaugurated by Mr. Gorbachev. The buried secrets of past regimes and the foibles of the present one were exposed to public scrutiny by a press given freedom to reverse decades of organized disinformation and report honestly about Soviet history and life. By permitting increased openness in the press and in cultural endeavors, he also freed the minds of the Soviet people, who began to voice their long-suppressed thoughts. After his arrival in Moscow from Stavropol in 1978, Mikhail Gorbachev quickly became one of the Politburo's most active members and caught the eye of Andropov as a fellow reformer and likely successor. In nominating him to succeed the Brezhnev loyalist Chernenko, Gromyko praised the new leader's "unquenchable energy" and commitment to "put the interests of the Party, society, and people before his own." Young, well-educated, articulate, and backed by the party and military chiefs, Gorbachev accepted a mandate in March 1985 to reform and strengthen the Soviet Union and to "realize our shining future." Nevertheless, during his first two years Gorbachev's domestic policies were erratic and largely ineffective. Without challenging the centerpiece of the Soviet regime- the planned economy- or its outsized military budget, the new general secretary and his political allies launched the politically damaging anticorruption and antialcoholism campaigns and also made futile attempts to boost industrial production and labor discipline. On February 25, 1986, thirty years after Krushchev had exposed Stalin's misdeeds, Gorbachev promoted his perestroika (reconstruction) policy before the Twenty-Seventh Party Congress. Unlike the mix of reforms occurring concurrently in China, which allowed decentralization and focused on agriculture and light industry as the motors of modernization, Gorbachev's was a top-down centralized program emphasizing heavy industry and maintaining many of the macroeconomic aspects of the Stalinist command system. It failed to alleviate the bottlenecks and shortages of the Soviet economy. Gorbachev's political views were more audacious. Unlike Deng Xiaoping, who, after the chaos of the Cultural Revolution, was obsessed with stability and ruled out democratic reforms, Gorbachev linked perestroika with a policy of glasnost (openness). Taking aim at the USSR's encrusted ruling party and bureaucracy, Gorbachev adopted a stillborn project of Andropov's to reduce their power by introducing new- even Western- ideas into the Soviet environment and engaging the Soviet population in modernizing the country. He went so far as to authorize the opening of the records of Soviet history, including its darkest moments, which ignited an explosion of criticism reaching back to Lenin's rule. To be sure, Gorbachev's purpose was to preserve the communist system by revitalizing it from above, but by combining perestroika with glasnost the Soviet leader risked unleashing forces he was ultimately unable to control. Gorbachev was even more daring in his foreign policy because he believed that the relaxation of international tensions was indispensable to his political reforms at home. Convinced that the Soviet Union's greatest threat was nuclear war but that its huge military budget was unsupportable, he intended to achieve security by scaling down the global rivalry between Moscow and Washington and reviving détente. After assembling a group of like-minded liberal internationalists, among them the new foreign minister, Eduard Shevardnadze, and his foreign policy adviser, Anatoly Chernyaev, Gorbachev boldly embarked on a step-by-step program of reducing the USSR's isolation and reaching out to the other side, which included Western Europe, Japan, and China as well as the United States. Gorbachev faced a wary Western audience, which he had hoped to woo with vows to end the arms race. Before taking office, during his December 1984 visit to Britain, he had referred to Europe as "a common home... and not a theater of military operations" and had convinced Thatcher that he was a man with whom the West could "do business." But the Reagan administration, facing unexpectedly strong congressional opposition to its military budget, was unreceptive to the new leader's message and intensified its charges of the Soviets' untrustworthiness and deplorable human rights record. Nonetheless, in a private message Reagan expressed interest in a summit meeting and assured Gorbachev of his hope to resume the search for "mutual understanding and peaceful development." The US and Soviet leaders met in Geneva in November 1985. At this first Superpower summit in six years, no treaty was signed, but the two-day meeting gave Reagan and Gorbachev an opportunity to evaluate each other and air their differences. Although they jointly declared that "a nuclear war can never be won and must never be fought" and agreed to accelerate work on nuclear arms control, Reagan defended SDI and Gorbachev refused to expand the agenda to include Afghanistan and human rights. Refusing to abandon his peace offensive, Gorbachev produced more surprises. Intent on rehabilitating the Soviet Union's reputation in world public opinion, he initiated major breakthroughs in human rights, beginning with the February 1986 freeing of the famed Jewish political prisoner Natan Sharansky. On December 19, 1986, Gorbachev personally phoned the dissident Andrei Sakharov to inform him of his release from his Gorki exile. One month later the Soviets ceased jamming the BBC, the Voice of America, and West Germany's Deutsche Welle broadcasts and lifted the censorship of banned books, such as Boris Pasternak's Dr. Zhivago. The KGB reduced the number of arrests for political crimes, and the government released almost all political dissidents and allowed greater religious freedom and freedom of expression. In 1987 the number of Jews granted exit visas rose to almost eight thousand from fewer than one thousand the year before. Still, Reagan was skeptical over the Soviet leader and hammered away at the "evil empire." During his June 1987 visit to celebrate Berlin's 750th anniversary, the president, standing in front of the Brandeburg Gate, urged Gorbachev to "tear down this wall" that surrounded West Berlin. Both leaders continued to express support for arms control, but it was Gorbachev, by suspending his objections to SDI and removing strategic-weapon reductions from the negotiations, who made a breakthrough treaty on intermediate-range nuclear forces (INF) possible. In 1981 Reagan had overridden NATO's Double-Track Decision by proposing the "zero option" (removing all missiles from Europe) which Moscow, predictably, had refused. The talks, suspended by Andropov in 1983, now resumed. Gorbachev's most impressive moment was still to come. On December 7, 1988, in his address to the UN general assembly, he declared the end of the Cold War, renouncing not only the 1945 Yalta settlement but also the ideological struggle between the Soviet Union and the West since November 1917. According to the Soviet leader, the Bolshevik revolution had entered the realm of history, and class conflict would no longer dominate global politics. "We are entering an era in which progress will be based on the common interests of the whole of mankind... The common values of humanity must be the determining priority in international politics, [requiring] the freeing of international relations from ideology." Gorbachev also repudiated the Brezhnev doctrine: "Force or the threat of force neither can nor should be the instruments of foreign policy... To deny a nation freedom of choice, regardless of the pretext or the verbal guise in which it is cloaked, is to upset the unstable balance that has been achieved... Freedom of choice is a universal principal, which knows no exception." Gorbachev's third point was to pronounce a new reality in the arms race: given the unlikelihood of a Superpower conflict, the principle of stockpiling arms was to be replaced with one of "reasonable sufficiency." To make this clear, he announced a unilateral cut of five hundred thousand men from the Soviet army and a withdrawal of fifty thousand soldiers and five thousand tanks from the Soviet forces in Eastern Europe, and he proposed negotiations on even greater reductions. One day later, during his private New York meeting with the outgoing Reagan and the new US president George H.W. 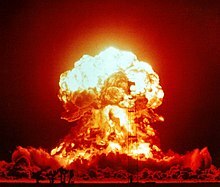 Bush, Gorbachev pressed for rapid progress in arms control leading to the complete abolition of nuclear weapons. Thus within three years the former Andropov protege had totally transformed Soviet foreign policy, replacing its messianic Marxist creed with a radical internationalism. 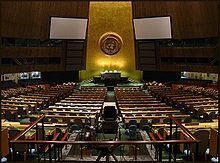 Among the strongest reactions was the New York Times, whose December 8 editorial stated: "Perhaps not since Woodrow Wilson presented his Fourteen Points in 1918 or since Franklin Roosevelt has a world figure demonstrated the vision Mikhail Gorbachev displayed yesterday at the United Nations." A number of scholars believe that the Cold War ended in December 1988 with neither a winner nor a loser. According to this view, one of the Superpowers simply called off the ideological rivalry that had begun in 1917, withdrew from the post-1945 arms race, and relinquished control over regimes dependent on Soviet force and economic subsidies for their survival. Although not everyone agrees, it is certainly reasonable to assert that without Gorbachev's bold international agenda the world may well have remained divided into two armed camps, and the events that followed would have had entirely different outcomes. He clearly did not foresee (nor did any of us) how quickly and dangerously things would fall apart in Russia once the strong disciplinary hand of the Party was relaxed. What he did in destroying the old system was a great historic service to Russia and the world. And nobody else could have done it. But he is not a good politician in the democratic sense. He has no adequate inter-action with the people at large. Yeltsin, not an intellectual but quite intelligent, is far ahead of him in these respects. Mr. President, you did a great thing. You gave up your post as general secretary of the Soviet Union, but now you have become the president of peace. Because of your wisdom and courage, we now have the possibility to bring world peace. You did the most important, eternal, and beautiful thing for the world. You are the hero of peace who did God's work. The name that will be remembered forever in the history of Russia will not be "Marx," or "Lenin," or "Stalin." it will be "Mikhail Gorbachev." By the time Reagan entered the White House, the Soviet economy had sunk into such a state of stagnation that it was obvious that communism had failed and a radically new approach was required. No one realized this more than Mikhail Gorbachev. Even though there never was much likelihood that SDI would render Soviet missiles ineffective, he nevertheless was obliged to take seriously America's technological potential and the strategic impact of even an imperfect defense. He also realized that the Soviet Union had insufficient economic strength to compete with the United States in another technological arms race. Nor could the Soviet Union continue to expend its resources competing with the United States in the Third World. Pressed by his country's economic weakness and alarmed by the increasing risks of a nuclear war, Gorbachev was more than willing to attempt to end the Cold War. Its resolution would enable him to reduce his country's expensive military establishment as well as obtain badly needed economic assistance from the West. Accordingly, Gorbachev changed the ideological content and declared goals of Soviet foreign policy and moved away from the concept of international class war toward a vision of peace and cooperation with the West. The U.S.S.R. is at a crossroads. If pressing economic and social problems are not alleviated in the near future, further erosion in its economic system is inevitable, thus endangering, in the long term, its very survival. . . . Gorbachev has definitely initiated a new style . . . But whether his stewardship will open a new era for the U.S.S.R. remains to be seen. . . . He faces problems that are almost insurmountable. President Gorbachev’s achievements were truly great and historic. Not only did he dissolve the Soviet Union more or less peacefully, but he also prevented a major civil war that could have escalated into a nuclear conﬂict. I sincerely hope that historians in the future will honor the major achievements and statesmanship of President Gorbachev and of the other leading Soviet politicians of that time. This page was last edited on 17 March 2019, at 05:15.